Our preschool program is accredited by the Southern Association of Colleges and Schools' AdvancED program and licensed by the Office of Child Care of the Maryland State Department of Education. Saint Francis International School follows the curriculum standards and policies of the Archdiocese of Washington as well as the regulations of Maryland's Office of Child Care that pertain to preschool programs. We particularly emphasize a focus on the whole-child (mind, body, and spirit). Our preschool curriculum is sensitive to the needs of a culturally and linguistically diverse student population. English language learning support and the school counselor are available to assist the preschool teachers. Placement in a preschool class at Saint Francis International School is determined by a combination of birth date, intellectual development, social/emotional development, and space. PreK 3 These classes consist of three year-olds who are fully potty trained and younger four year-olds. Students must be at least 34 months on Sept. 1st to be considered for admission. PreK 4: These classes consists only of students whose fourth birthday occurs before Sept. 1st of the current school year and who will be "age-eligible" for Kindergarten the following year..
We emphasize the need to prepare our young children for success in elementary school and beyond while acknowledging their specific developmental abilities and needs. Accordingly, our curriculum focuses on intellectual development, social and emotional development, and physical development in a comprehensive and holistic manner. Academic and social skills are woven into a curriculum that balances children's need for play, art, and friendship with their curiosity and desire to learn. 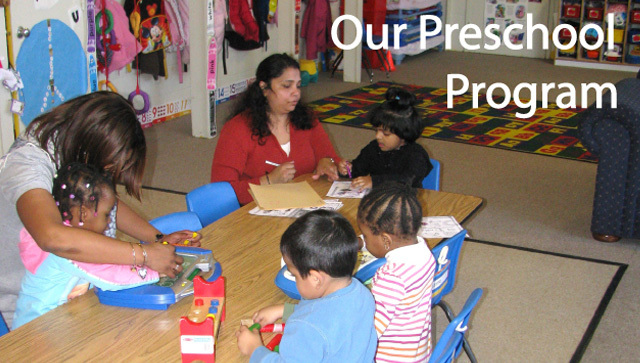 Our preschool program uses the Maryland Model for School Readiness as a guide. Our program uses integrated curricula that address all of the domains of learning and provides students with knowledge and experiences in all of the main academic content areas. Currently the St. Camillus preschool program uses the following books and materials. These series may be changed for the 2010-2011 school year. PreK 3 uses Let's Begin with the Letter People as the core academic curriculum. PreK 4 uses Little Treasures by Macmillan McGraw Hill as the core academic curriculum.. The heart of our program is our well trained group of teachers. Their service to our children is born out of their faith and their desire to see each child grow to his or her fullest potential. Our teachers hold the belief that each child is unique and special and deserving of love and attention.